Good Dog. Stay. by Pulitzer Prize winning author Anna Quindlen, is a delightful little book. It’s short, sad and sweet. Of its 82 pages, only 32 of them are text – the rest consists of expressive black and white photographs of adorable dogs gazing back at you with the liquid, loving eyes. The book is also sad. 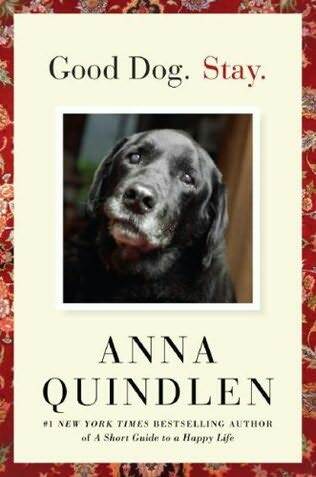 The author reflects back on the life of her devoted black Labrador Retriever, Beau, who was part of her family for almost fifteen years. And yes, it does deal with the dreaded decision of having to put Beau down as his infirmities multiply and worsen. So keep your Kleenex handy, but your mind open. This is a tribute to all good dogs as well as an uncanny observationof what we humans can learn from our canine friends, fo what they can tell us withoug using words. The book is also sweet – or bittersweet, to be more precise. It’s heartwarming, even humorous in parts. But the essence of the book is best expressed in its very last sentence, “Sometimes an old dog teaches you new tricks.” Recommended for dog lovers everywhere and perfectly appropriate for reading during these “dog days” of summer.